This is a simple skating drill. The focus is simply on footspeed. This drill pushes players to move their feet faster and longer than most drills. 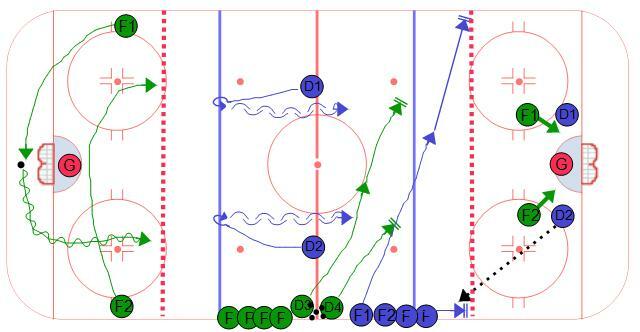 This is a simple shooting drill but the emphasis is on overspeed skating in the neutral zone. Players start the drill by sprinting to the blue line and doing quick cross-overs towards the middle of the ice. They should do the cross-overs as tight as they can and move their feet as fast as possible. As they skate back towards the red line they should cut across as to support hte puck and call for a pass. After they receive the pass they should keep their feet moving and attack the zone to the outside. Encourage players to shoot with their feet moving and stop on the net. After the shot they should go into the slot and hunt a rebound as the next shooter attacks the net. This drill focuses on footspeed. It is an overspeed drill where players should be moving their feet the entire time. Players start without a puck and skate to the blue line where they do quick cross-overs and skate back towards the line from which they started. Again they do quick cross-overs towards the middle of the ice then call for the puck as they skate towards they outside. When they receive the puck they attack the outside and move their feet down past the hash marks. They should sell it like they are driving to the net, then escape towards the wall. Again, stress to the players they need to move their feet up the wall and into the middle of the ice for a shot. Players should stop on the net for a rebound, then skate into the high slot and hunt a rebound for the next shooter. This variation adds a couple of passes. The player skates the same route but this time they receive a pass from P2 after their first turn. Then P1 makes a pass to the next player in the line where they started. P1 will get the puck back as they turn up ice, support the puck through the middle and call for the puck. There are several points of emphasis in this hockey drill. First, it allows wingers to get familiar with another option when receiving a breakout pass along the boards. So many times the wings try to force the puck up the boards when there is pressure coming from the point. The defense in this drill provide support so the wings can give a pass back the defense. After they make that pass they try to beat the pressure up the ice to create an odd man advantage. The weak side forward needs to time their route to the middle so they are available for a pass from the defense and occupy the space vacated by the player applying pressure. The attacking forward can then read the ice as they attack the defense from the other side. Fd, after applying pressure becomes the backchecker. 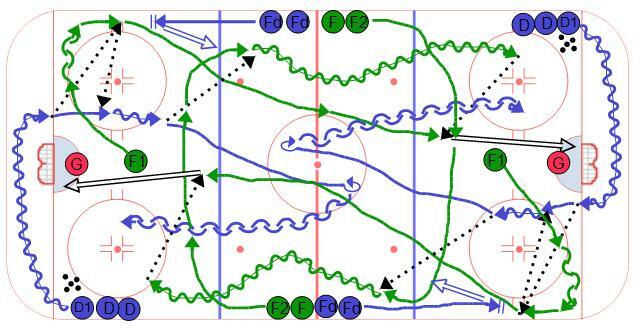 You can run this hockey drill out of both ends if you have enough players. There are several defensive minded key points to this hockey drill. The first is the gap control. The defense should never give up the blue line because it is always a 2 on 2. Offensively, forwards need to make smart plays and chip the puck into the zone instead of trying to beat guys at the blue line. Down low in the defensive zone the defense need to play tight man on man and make sure not to get beat back to the front of the net. The defense need to limit the time and space of the forwards. The forwards down low in the offensive zone need to maintain possession of the puck and be patient to limit turnovers. The drill starts with two forwards in one zone at the hash marks and a puck behind the net. The defense start inline with the dots at center ice. On the whistle one forward swings behind the net and picks up the puck, the other swings in front of the net. The two forwards attack the two defense 2 on 2. Once they cross the offensive blue line, two new forwards sprint out to the breakout positions at the top of the circle (they cannot go below the top of the circle). Two new defense also come out to the blue line and should position themselves inline with the dots. Meanwhile, in the 2 on 2 down low, the defense will try to get the puck and make a breakout pass to one of the two new forwards. The two on two is then going the other way against the two new defense. If the goalie feezes the puck or a goal is scored, the coach plays a new puck into the active zone. View more of our defensive hockey drills.